This dresser is a classic Shaker design that is built by an Old Order Amish craftsman in Lancaster County, PA. We find that our customers feel good about purchasing American made furniture and appreciate the fact that it's solid wood. Ten spacious dovetailed drawers offer plenty of storage space for your master bedroom or guest room. Wood drawer slides are standard on the drawers but we offer an option for full extension as well as soft closing drawer slides. 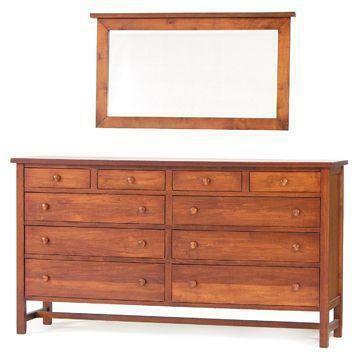 Choose to add a beautiful Amish made mirror as an option for this dresser. The simple lines of this Shaker Dresser are what will make it stay in style for years and years. This Triple Dresser is made to order for each customer and can be customized. Please call to speak to one of our Amish furniture specialists with questions on our furniture.